Here’s what’s up in the world of TV for Sunday, February 8. All times are Eastern. Better Call Saul (AMC, 10 p.m.): What was once a mere internet rumor has come true: Breaking Bad prequel Better Call Saul is finally premiering tonight. 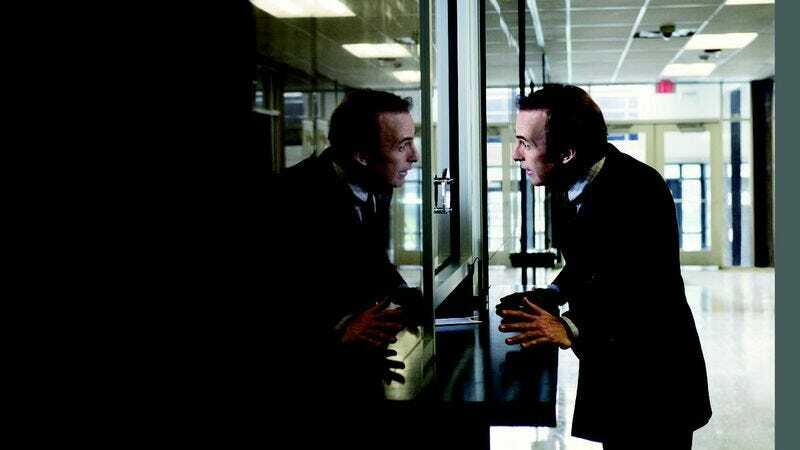 The series, produced by the Breaking Bad team, will follow Bob Odenkirk’s Saul Goodman before he was even Saul Goodman. Will it benefit from its Breaking Bad connections? Or will it stay stuck in that intimidating shadow? Will it feature a dizzying array of brightly colored dress shirts? Who knows!! Oh no wait, Erik Adams does. Check out his pre-air review, and then return to the show page for weekly thoughts from none other than our former Breaking Bad correspondent, Donna Bowman. The Walking Dead (AMC, 9 p.m.): Meanwhile, Zack Handlen is once again on Walking Dead duty, as the fifth season premieres tonight. Last Week Tonight With John Oliver (HBO, 11 p.m.): We would like to extend a hearty What’s On Tonight welcome to the second season of John Oliver’s look back at the week that was and the pressing issues that are. The promotion for this season has promised more of “basically the same,” which…is totally cool with us. The 57th Annual Grammy Awards (CBS, 8 p.m.): This year’s ode to the alleged best music of the year will feature performances from Beck, Sia, Mary J. Blige, Ed Sheeran, John Mayer, Questlove, etcetera and so on. Join A.V.’s music critics for a livechat, which could very well turn into a support group should Iggy Azalea walk away with Best Rap Album. The EE British Academy Film Awards (BBC America, 8 p.m.): If you’d like something more or less the opposite of the Grammys, though, may we suggest the BAFTA’s? American Ninja Warrior: America vs. The World (NBC, 8 p.m.): NBC’s popular competition returns for what frankly sounds like an unfair fight. Bar Rescue (Spike, 9 p.m.): The fourth season of bar rescuing premieres to the tune of crushing debt, clueless people who thought buying a bar with their friends would be fun, a disgusting kitchen, and Bar Scientist Jon Taffer’s hysterical barking. We assume. 30 For 30 (ESPN, 7:30 p.m.): The series comes back with “Of Miracles And Men,” a new look at the famous 1980 Olympics hockey game when America upset the Soviet Union. Lest you think you’ve seen enough on this well-trod game, 30 For 30 is exploring the Soviet perspective after their loss. Cloudy With A Chance Of Love (Hallmark, 8 p.m.): What’s up, Hallmark? “A Meteorologist Is Thrown in to a Whirlwind of Love When Katie Leclerc and Michael Rady Star in Cloudy with a Chance of Love, A Hallmark Channel Original Movie World Premiere…Stacey Dash and Gregory Harrison also star in the network’s latest Valentine’s Day-themed original.” Oh, okay. Captain America: The First Avenger (FX, 5:30 p.m.): FX appears to be having a Very Avengers Sunday, what with it playing The Incredible Hulk, Thor, Captain America, and finally, The Avengers itself (8 p.m.). But we here at What’s On Tonight firmly believe in playing favorites, and so Chris Evans and Hayley Atwell get our preferential pick. We also look forward to the day we can tell you all to watch a marathon of female Avenger movies, so…see y’all in 2094, probably.